The Northam Motorsport Festival is a free classic car event for all ages. 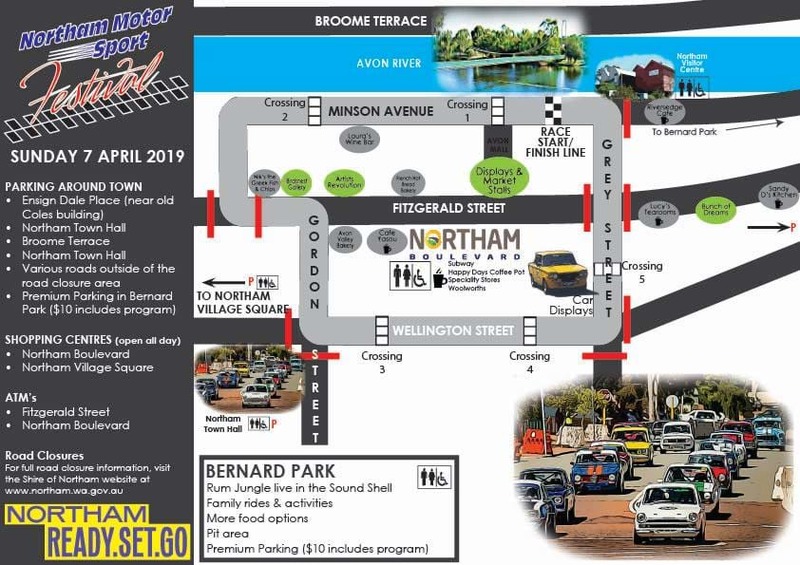 The main streets of Northam will be transformed into a circuit with classic racing cars competing in regular time trials. The event incorporates the SCBC Motokhana on the Saturday, and the Northam Flying 50 around the town on the Sunday. You can also freely access the car display areas, market stalls, retail, cafe and hotel outlets as well a huge show in the Sound Shell, and children's rides and activities in the family fun area. The Northam Motorsport Festival is a major highlight on the Shire of Northam annual calendar, and is a great opportunity for all ages to enjoy the history and spirit of classic racing cars. Be aware of road closures this weekend. 12.00pm and Midnight – Beavis Place, Minson Avenue (From Peel Terrace to Beavis Place), Gordon Place. Grey Street (Between Minson Avenue to Fitzgerald Street) to enable preparations of the Northam Motor Sport Festival street race. 00:01am to Midnight – Fitzgerald Street (Gardner Street to Ensign Dale Place), Wellington Street (Beamish Avenue to Prince Road), Grey Street (Minson Avenue to Duke Street), Elizabeth Place (Gordon St to Ensign-Dale Pl), Gordon Place, Gordon Street (Fitzgerald Street to Duke Street), Beavis Place, Minson Avenue (From Peel Terrace to Beavis Place) to enable the Northam Motor Sports Festival to take place. The event incorporates the Mount Ommanney hill climb, SCBC Motorkhana on the Saturday, and the Northam Flying 50 around the town on the Sunday. You can also freely access the car display areas, market stalls, retail, cafe and hotel outlets as well a huge show in the Sound Shell, and children's rides and activities in the family fun area. Please note that a number of streets will be closed for the Sunday of this event, and as such, traffic through the centre of town will be disrupted. Crossings will be opened between races to allow pedestrian access and egress from Fitzgerald Street. Please note that this is a drone free event. If any drones other than the official event drone are seen in the air during the event, proceedings will be stopped for safety reasons.